Great Danes grow up to be one of the largest breeds of dogs in the world. They are one of the few breeds that are considered Giants. These guard dogs need a lot of good quality puppy food to reach their full potential and stay in good health. Here are a few things you should look for when it comes down to choosing the best dog food for your Great Dane puppy. Calorie control can be a challenge. While you want your dog to grow you don’t want them to grow too fast. Steady and controlled growth can help your Great Dane puppy avoid hip and joint issues over the years. For Great Danes, this is a major concern that can lead to significant loss of quality of life over the years. Great Danes eat A LOT! While some giant breeds have slow metabolisms, the Great Dane puppy is going to devour a lot of kibble. I am not suggesting that you get the least expensive thing you can but it is important to realize what is affordable and what isn’t. This is something that should be considered before adding a Great Dane to the family. The good news is there are a lot of affordable high-quality options. In fact, you may be surprised how much further some of the brands go when compared to budget brands. The puppy stage is the most important time to make sure to feed your pet the best you can. This is the food that is going to set the foundation for your dog’s long-term health. Great Dane’s ideally have a lot of lean muscle. A high protein diet with controlled calories helps them achieve this. A diet that allows them to get 25% of their calories from protein is ideal for growing puppies. If the protein content of a puppy food you are considering doesn’t offer this then look for another. Giant puppies take a while to reach adulthood. You should consider your Great Dane a puppy for the first two years of their life. This means feeding a high protein food designed with calorie control in mind so they grow at a reasonable rate over the two years. While Great Danes can reach their adult height quickly, they take time to fully develop and fill out their frames. 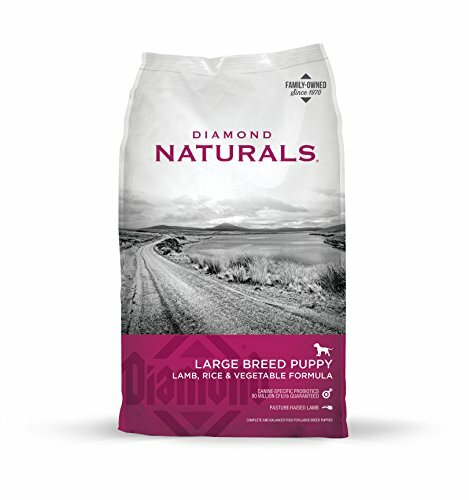 Diamond Brand Large Breed Lamb and Rice Puppy Food is a favorite of mine. For those that are new to my posts, I have been a dog parent of Great Pyrenees for 18 years, so I have some experience with giant breed puppies and their needs. Diamond Naturals offers the best quality for your money. I have never heard of any Diamond product being recalled and they make their dog food in the USA. Lamb is mostly grass fed and there is no corn, wheat, or soy in this formula so you are getting something that doesn’t contain a bunch of GMOs or herbicide and pesticide residues. The price is equal or less to what you pay for a lot of the mid range kibble at the grocery store. Probiotics in every bite means your pup gets a great start with healthy levels of gut bacteria that aid with nutrient uptake and digestion. Victor Brand is not as well known as some but it should be. 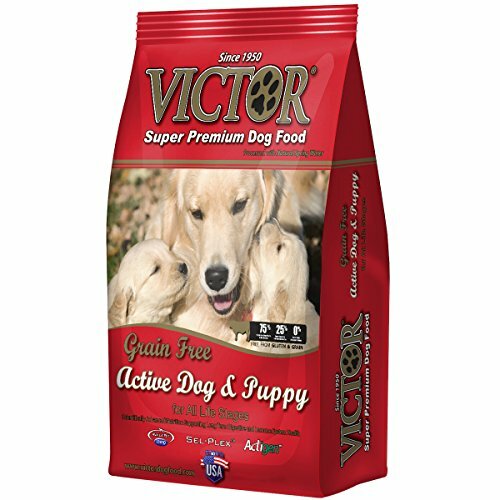 Victor offers amazing formulas of dog food at a good price and they are another brand that I like because they have never been involved with any major food recalls. I am a member of a few Facebook groups where people have a lot of giant breeds and I have seen a lot of them recommend Victor to others that are new to the world of Giant dogs and their needs. Royal Canin is famous for their breed specific formulations. A lot of pet parents are fans of this brand and make a point to use it at all life stages. Breed-specific food does ensure that a lot of attention has gone into creating a formula optimized for your dog. 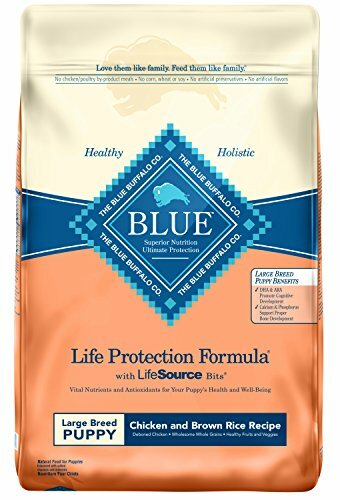 This is a brand that I have not heard any major negatives about during my research beyond pet parents saying their dog is picky or has a sensitive stomach. These issues could easily be caused by something else so I don’t consider them enough to dissuade me from mentioning Royal Canin. This is a good alternative to expensive prescription-only dog foods from the vet as well. 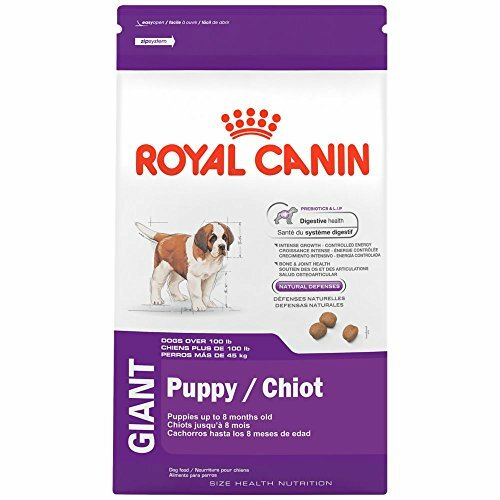 This formula is a great start for giant breed puppies. After eight months on this formula, you can switch to the Giant Breed Junior formulation. 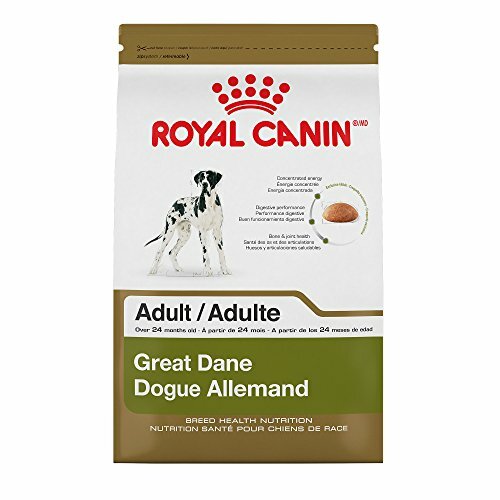 At 18-24 months, try the breed-specific Great Dane Adult Formula offered by Royal Canin. 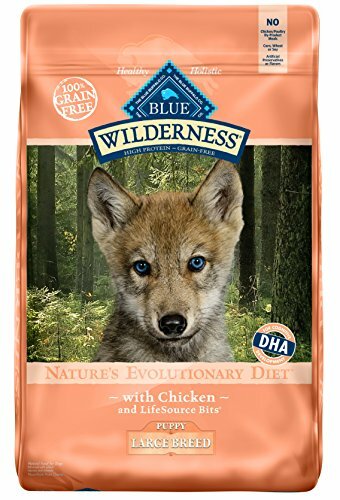 This is one of the few companies that recognize that giant breed dogs have two different nutritional steps to make before eating an adult dog food. While plenty of pet parents use just puppy food and then an adult ration, having an in-between formulation can help take the guess work out of the exact amounts and calories needed. 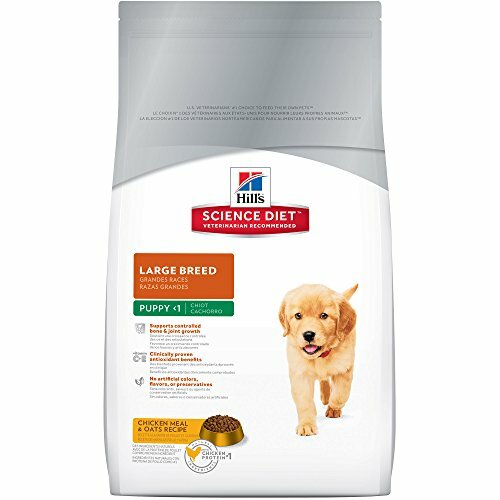 Hill’s Science Diet is a well-recognized brand that offers countless formulas to meet almost any dog’s needs, so it is no surprise that they offer an affordable large breed puppy formula. This chicken-based formula gets a lot of positive reviews from dog parents. It is formulated with your Giant puppy’s needs in mind. It has a very specifically formulated complex of antioxidants to help boost immunity. There are no artificial colors or preservatives in this formula, so it is great for even the most sensitive puppies. 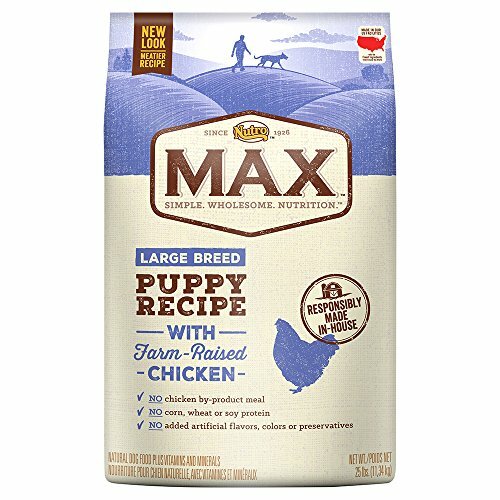 This delicious chicken and rice recipe is specifically formulated to provide great nutrition for your large or giant breed puppies. Blue Buffalo has an outstanding reputation for quality. Controlled calories and balanced nutrition mean your Dane is going to grow at the right rate and have a better chance of being healthy. This formula contains no corn, wheat or soy. What you will find in this food is a wholesome blend of chicken, whole grains, fruits, and veggies. The chicken in this food is the good stuff too– you will never find cheap poultry by products in Blue Buffalo. Nutro is a budget-friendly quality brand that offers precise formulations for large breed puppies. This is another chicken and rice formula. A big difference between Nutro and a lot of commercial dog foods is that it contains no artificial colors or flavors and the real chicken that is grown and processed in the USA. 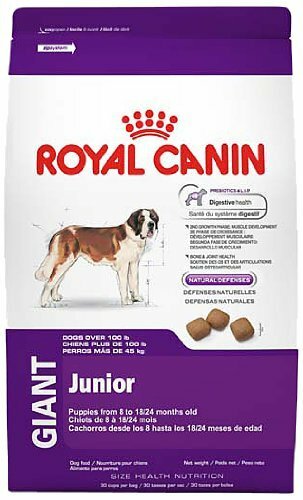 I have never heard of a Nutro product being recalled for any reason. I love that Nutro proudly says on each bag that it is produced without GMO ingredients. This high protein puppy formula helps Great Dane pups develop lean muscle mass while offering controlled levels of calories and fats so growth is regulated for a lifetime of good health. This is a total grain-free formula. The first ingredient in this puppy food is chicken. You will find no garbage ingredients in this food; there are no artificial colors and flavors, preservatives, or animal by-products. If you want to go grain-free it is hard to go wrong with Blue Buffalo formulas. I like that this formula contains fish oil which is high in Omega-3 and 6 fatty acids. Natural DHA helps puppies develop good cognitive skills. If you are going to be a dog parent, please plan to feed your puppy a quality food. This is the most important time to feed the best you can afford. Stong lean muscle development and controlled growth will help you to avoid visits to the vet and needless suffering. Great Danes are a Giant breed, and that means that special consideration should be made. Scout found a lot of great picks for you that are in a reasonable price range as well as some higher-end foods. Of course, if you have any questions just ask your vet.